Starring: Vin Diesel, Dwayne Johnson, Jason Statham, Michelle Rodriguez, Tyrese Gibson, Ludacris, Charlize Theron, and more. Awhhhh yeah, that fateful time has come again. Audiences all over the world are now free to see the 10th installm… Wait… The 7th installmen… That one is done already? What one are we on?… The 8th installment! Yeah that’s it. The 8th installment in the ‘Fast and the Furious’ series, ‘The Fate of the Furious’! Everyone’s favorite fast crew is back taking on high expertise missions and combating global terrorist groups. I know, we’ve come a long way since this was about street racing but hey, cars, right? Whatever, time for ‘Fate of the Furious’ to get Oberrated. I do not do well with corny BS one-liners when it comes to some films and this series has become so much of a joke, I have come to expect those one-liners now and it is kind of sad, to be honest. In regards to this topic, I almost walked out within the first ten minutes due to a corny one-liner dropped of “..it’s your fate, Dom” GET THE F*&# OUT OF HERE. My friends and I were WAITING for more corny Fast puns somewhere throughout the film. Thank God we didn’t get what we expected most of the time. In the first race we were anticipating that scantily clad woman calling the start of the race to say “Be fast…. Be furious”. Again, just a symbolization of what a joke this series has become to my friends and ultimately myself. I used to highly anticipate these films and get excited, now I am just wondering… What the hell are they doing next? These newest installments are thriving off of the sheer element of entertainment. They have their die-hard followers (and I would even consider myself one). They have a legacy of adrenaline-pumping car scenes which brings in the crowd. But now, it is far beyond realistic sequences and anywhere near relatable stories. As I said in the intro, we are talking about a crew of street racers who are now international crime fighters. So now, I am getting into the garbage of this film and again, spoilers are coming because this is just a joke… So, Cipher (Charlize Theron), is this mastermind hacker whose evil plans have been foiled by Groot, I mean, Dom (Vin Diesel), two times. She has the capabilities to practically be anywhere at anytime and even has the capability to hack cars, control them at her will, and virtually turn them into a horde of zombies… You may call BS but really, there is a scene where she literally has hundreds of cars driving remotely and navigating the streets. Hitting corners in hordes like they are zombies. Some of these cars include old school taxis and soccer mom vans. You get that, right? Hacking into the “system” of an old school taxi or soccer mom van. THEY DON’T HAVE THAT KIND OF SYSTEM! That is it, I am done here. Now wait, I have good things to say about ‘Fate of the Furious’. Despite all my groaning annoyance with the film, it did what it intends to do. It is entertaining, I will not deny that. With that result alone, this film will continue with its plan of making two more films. People will love this element and it will be successful… Now back to my thoughts on its entertainment value. The comedy was on point in most circumstances. The series has always had a knack for making me laugh and it is irresistible when it comes to the likes of The Rock, Ludacris, and Tyrese who play Luke Hobbs, Tej Parker, and Roman. The trio is just too charismatic and too easy to love to not find their bickering and jokes unfunny. Dwayne “The Rock” Johnson is every stereotype you can imagine when it comes to his on-screen character of Luke Hobbs and the constant battles between Tej and Roman are funny as always. A special note must go to Charlize Theron as the villain Cipher. Charlize is leagues better than a villainous role in a Fast film. She is merely a queen among boys when it comes to this film. Last note; critics are being paid to say saying the action is wild and on point. Once again, I can not separate myself from the wildly outrageous fact that these are street racers with some special trained individuals thrown in the mix facing off with government personnel and international crime syndicates. Yet somehow the bad guys have the accuracy of storm troopers and these racers are moving their cars as if they are in The Matrix. Yay explosions and hand-to-hand combat. ‘Fate of the Furious’ was a glorious trainwreck. While it did its best to deliver everything a Fast fan would typically love in cars, women, adrenaline filled scenes, and lightly salted comedy, it failed to make any sense yet again how a group of street racers are now highly trained crime fighters. Great entertainment but absolutely juvenile and ridiculous as it has been known to be in the past few films. 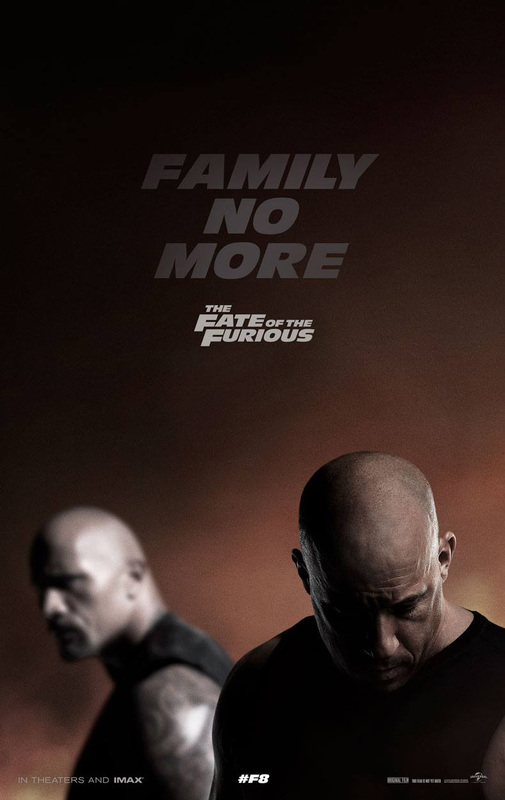 Posted in 2017 Movies, Movie Review.Tagged Charlize Theron, Dwayne Johnson, F. Gary Gray, Fast and the Furious, Jason Statham, Kurt Russell, Ludacris, Michelle Rodriguez, Nathalie Emmanuel, The Fate of the Furious, Tyrese Gibson, Vin Diesel.